Paolo Zacchia (1584-1659) was an Italian physician, father of the forensic medicine. He was archiater of Innocent X1 and Alessandro VII2 and also a protomedicist of the Papal State. 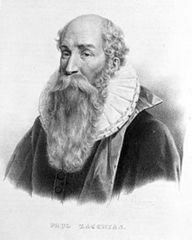 He made substantial progress in the study of forensic medicine with the work “Quaestiones medico-legales” (1621-35), considered a classic text throughout Europe.